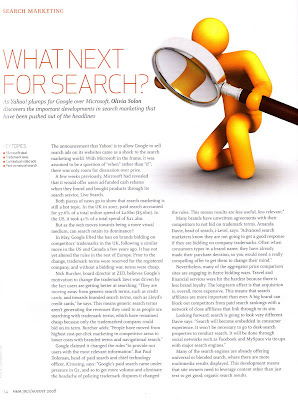 The article considers the 'important developments in search marketing that have been pushed out of the headlines [as a result of the continued speculation around Yahoo! and Microsoft]'. The first part of the article covered Google's removal of restricted trademark bidding in the UK and this is where my quotes were included. My comments were also backed up by Hitwise study into the growth of navigational search. Robin Goad writes: "navigational search has been increasing; in 2007, 76.0% of search volume for the top 2,000 terms was navigational in nature, up from 63.6% in 2006 and 58.2% in 2005." The impact of Google's trademark changes has varied significantly by sector. The short term effects are obvious (more competition, increased cost etc), but it is still too early to tell what the long term effects of the changes will really be.